Pneumonia is a disease that is quite common among the elderly especially during cold weathers. What is the reason behind this? What's wrong with the elderly? Even in today's modern world, we just cannot escape from sudden calamities. This is especially apparent during cold seasons where the elderly people are more easily affected with pneumonia. What is the reason behind contracting pneumonia easily? Even in these modern medical times, hundreds of elderly are losing their lives just because of pneumonia. Just less than two months after the Japan tsunami and nuclear crisis, nearly 300 people were diagnosed with pneumonia and more than 200 died within 50 days. What went wrong? What is the real cause of pneumonia? Is there no easy way to protect yourself from contracting pneumonia? Indeed, there is something that was not properly done. What is it? Calamity came, then, daily activities and lifestyle of the victims had changed. Although shelters, blanket, foods, hot drinks, and enough medical care by medical volunteers and city officials were given, many are still affected from pneumonia. Several medics attended in finding the cause of pneumonia, and found a simple reason that's causing it. The spread of pneumonia among the elderly in evacuation centers can be solved simply by a simple daily cleaning of teeth and gums. Yes, you may say that you are brushing your teeth well every now and then. But what we mean is gums. Yes, you read it right—brush your gums! Brushing your gums and other hidden corners of your teeth are important because these are the areas where bacteria and other harmful and toxic objects stay. Actually, a healthy person is capable in fighting harmful bacteria and other toxic elements that enter the body, but this is not the case for the stressed elderly. It is also the reason that the rate of contracting pneumonia is higher among elderly people. Stress is one of the major reasons that cause pneumonia, too. Why? Stress can make your brain function weaker. The epiglottis, which is a flap of cartilage (located at the root of tongue) that prevents food and drink from falling down the airway, cannot be controlled by a stressed brain. Just like a chain reaction, we would eventually suffer from pneumonia if the epiglottis is not functioning properly. Clean your mouth, brush your teeth and gums, and do tapping touch therapy, including feet exercises to avoid deep vein thrombosis. Then, you'll be able to stay clear of this pneumonia. Brush your teeth and get healthy. Good luck! - Approximately 1.2 million people are hospitalized every year for pneumonia. That's third after births and heart disease. 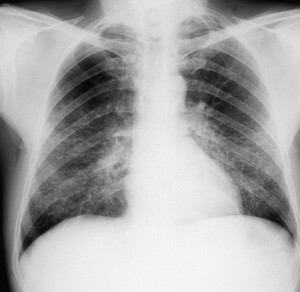 - Pneumonia is a serious disease that affects 1 out of every 100 people every year.